After having a lesson of Taichi Dowing 太極導引 with Shang-wei who learned from Master Xong Wei 熊衛 since 1996, we headed to Xing-yi's home near by. 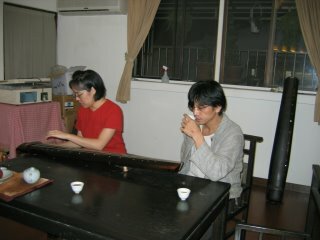 Xing-yi is the correspondent secretary of Zi Ten Lu Tea House and a good friend of Shan-wei. 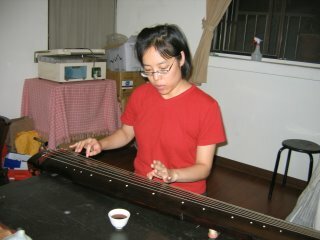 Xing-yi plays guqin for 5 years already. 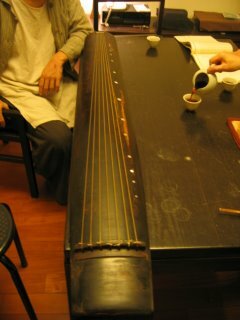 He learned guqin from Master Zhuang Xiu-zhen. At Xing-yi's home, there are 3 qins. One is a real antique qin, and one is a qin made by Yei Shi-qian (see the photo below) and one is a factory made. Xing-yi let us heard a recording of Zha Fu-xi's 查阜西 singing of Qin song. As Xing-yi said, Zha's singing was so warm like an old pa telling a life story. I am so happy to hear Zha's qin song which is really treasures. 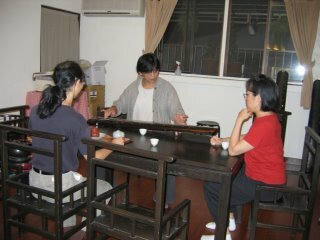 Xing-yi played Cai Zheng-you 采真遊, a taoistic qin piece that he dapu from Xi Lu Tang Qin Tong 西麓堂琴統. His playing was really nice. I played Xiao Xian Shui Yun. Shan-wei played his improvised piece. The Qin made by Ye Shi-qian.